Nursing home falls and bedsores are the two most common causes of nursing home lawsuits in Maryland. Eldercare facilities consistently ignore that overwhelming evidence of risk to elders and fail to either implement a fall risk protocol, or they ignore the protocols in place. In our mind, the key nursing home fall statistic is that one-third of nursing home residents who are admitted to a hospital after a fall dies within one year. Even if the patient does not die in the hospital, the one-year mortality rate is 22%. It is not hyperbole to say that the risk of a serious hospital fall can be graver than cancer or heart disease diagnosis. If heart disease or cancer could be caused by the failure to take simple precautions, you can bet our nursing homes will devise and implement to the letter quality systems to reduce the risk. But when it comes to falls, nursing homes consistently ignore the overwhelming evidence of the risks and what can be done to mitigate those risks. Can you eliminate all nursing home falls? No. But the vast majority are caused by nursing homes' failure to elevate the care to the level of risk. What Must Nursing Homes Do to Protect Residents? A nursing home is not a fast food restaurant. People live 24 hours a day in nursing homes. These facilities promise to give our elderly with adequate care and assure them that they will keep them safe and treat them with respect. Many of these obligations are set out in federal law under the Omnibus Budget Reconciliation Act of 1987 (OBRA). The OBRA regulations are a national standard that is reiterated in Maryland law. This law requires that upon admission, the nursing home must fully assess the patient's condition, functional capacity, and needs. This assessment will determine the resident's risk for falls. Assessment guidelines include a complete review of the patient's medical history, recent hospitalizations, medications, visual or hearing deficits, lower limb joint function, gait and balance, cognition, continence, and neurological and cardiovascular examinations. If the resident is found to be at heightened risk, an individualized strategy must be designed for that patient. Nursing homes often fail to develop the right fall prevention protocol for its residents. But a more frequent mistake is failing to reevaluate the patient when a new assessment is warranted and incorporate these developments into a new plan. The assessment for a resident when they enter the facility is of little use five years later. 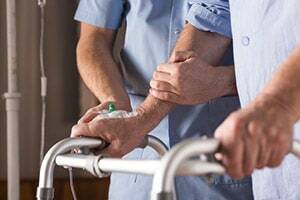 In sum, the standard of care for a nursing home requires that residents be fully assessed and reassessed for his risk of falls and that appropriate protocols in place to prevent falls. This requires that every nursing home employee is trained and qualified to recognize those residents at risk for falls and that the facility ensures that each resident receives adequate supervision and assistance to prevent falls. Who is at Risk for Nursing Home Falls? The starting point has to be every resident is a fall risk. The medical literature has found that the two biggest risk factors for falls are age and cognitive impairment. Other risk factors include being female, history of falls, arthritis, obesity, high or low blood pressure, Parkinson's disease, dehydration, lower extremity weakness, balance problems, and psychotropic drug use. What can be Done to Protect Our Seniors? There are many tools nursing homes can use to mitigate fall risk. You can find a list of some of these tools here. But the important thing is that these methods work if someone cares enough to figure out what the patient needs. This is why the standard for fall prevention mandates that nursing and other staff systematically reevaluate the effectiveness of the measures taken and devise new ones in the face of new facts. These are nursing home cases. They are not slip and fall claims. If you try these case as slip and fall cases, you are going to get slip and fall sized verdicts. If you try the case as a nursing home case and you focus on the safety regulation violations, their failure to meet the community's standards for the level of care our seniors deserve, and the nursing home's refusal to take responsibility, you will get a much different settlement or verdict. Green v. Encore: Patient recovering from a fall has another fall in an Ellicott City nursing home and breaks her hip which causes her death. Skakra v. FutureCare: Woman has 15 falls in 20 months at a FutureCare facility in Arnold, Maryland. Tarleton v. Glen Burnie Health and Rehabilitation Center: A resident fall, breaking his hip. Like many serious fall victims, he dies a week later. Eichelberger v. Emerge: Nursing home fall wrongful death case. The family's lawsuit claims that having an appropriate fall risk plan in place would have prevented the death. Young v. Good Samaritan Hospital: This is not a nursing home case but the same paradigm applies. In this case, the question is whether having a small woman discharge a 300-pound man was appropriate. The man suffered an awful fracture and died a month later. Have you or a loved one suffered as the result of the negligence of a doctor, hospital, or nursing home? Our law firm, Miller & Zois, has a long history of getting results in serious injury and death cases in Maryland, earning substantial verdicts and settlements. Call Miller & Zois today to speak to a medical negligence attorney who can help you, at 800-553-8082, or get a free online case review. February 2018 fall lawsuit against FutureCare after an unsupervised woman fractured her femur. Another January 2018 nursing home fall case against FutureCare. This is the rare case the focus of the case is more on generalized bad care than specific negligence that caused a specific injury. Another January 2018 case. Seriously. This one is against Stella Maris. The preceding FutureCare case was in a nursing home that is really struggling in terms of Medicare ratings. This lawsuit is against Encore is Ellicott City, which is a beautiful nursing home that gets great reviews. You do not seem many nursing home lawsuits against small nursing homes. This case is an exception, a wrongful death fall case from a hip fracture in Baltimore County.